Delicious World is an awesome casual management simulation game from GameHouse. Join Emily, young and determined aspiring chef, as she begins her exciting journey to achieve her lifelong dream. Experience a compelling story around the world baked with the most delicious ingredients: a spoonful of love, a pinch of friendship and a whole lot of fun. Discover original and stunning hand-drawn restaurants in every chapter. Cook, serve and learn new recipes as you make your customers happy! Combine several ingredients in a dash and survive the kitchen craze before your hungry customers leave. 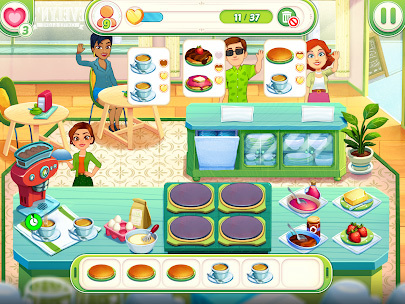 Upgrade dozens of kitchen appliances and improve the restaurant to beat all the challenges. Follow Emily through addictively fun levels, from cooking pancakes in a cozy family café to preparing sophisticated high cuisine dishes in beautiful Paris, the city of love. Meet all kinds of interesting characters along the way, all drawn in a charming and vibrant style. Discover their unique personalities. Travel to exotic locations and master their most signature dishes. Fall in love with a cast of endearing characters with rich and unique personalities. Combine ingredients to find the perfect recipe in fast and fun levels. Beat levels to get keys and progress on your journey to become a great chef. Unlock new challenges and special mechanics in every location. This entry was posted in Android Games, iOS Games, Mobile Games, Walkthrough and tagged Delicious World Cheats, Delicious World Game, Delicious World Gameplay, Delicious World Guide, Delicious World Hints, Delicious World Review, Delicious World Solutions, Delicious World Strategy, Delicious World Tips, Delicious World Walkthrough by Marvin. Bookmark the permalink.